Before you enter Ben Sargent’s shop, you hear the bustling clamor of the Austin, Texas landscape. Cars, freight, and distant chatter of the Austin natives pound in your ears but once you step over the shop’s threshold, the roaring city sounds snap shut and a soft melodious metal clacking and clicking takes over. Ben was gracious enough to let us take a winding tour through the fine workshop of Sargent Brothers Printers & Typographers and gave us the details on how he orchestrates such a gifted letterpress print shop filled to the brim of of musing, stories, and great design. THE PRESSES: We rely on our dear old Chandler & Price 10×15 Old Series, which was built in 1905, acquired by my father and his brother when they were teenagers in 1928, and in the family ever since. Still runs like a watch. 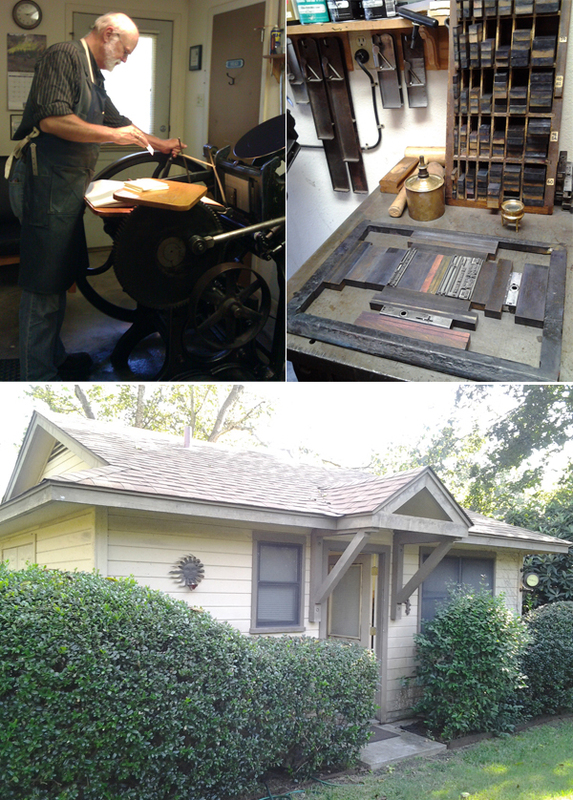 SIZE OF PRINT SHOP: 289 square feet. THE LOCATION: Our shop is my one architectural accomplishment; I drew it and a carpenter friend built it, back in the late ‘80s. It’s a little 24-foot-square house on the back of our property in South Austin. 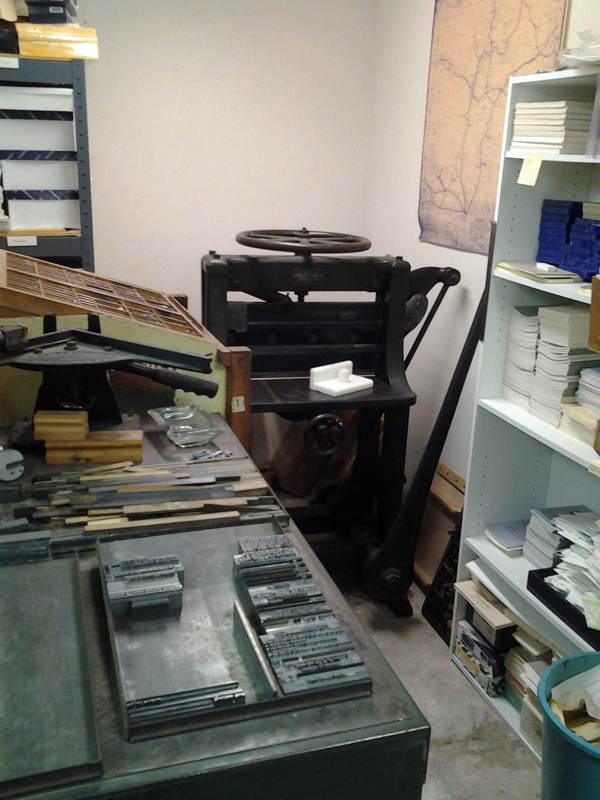 FAVORITE THING ABOUT THE SHOP: I like that my shop is out of the way of all our other activities and makes a cozy, quiet and compactly organized place to pursue printing. Much of our equipment — including our press and most of our 245 fonts of handset type — I inherited from my dad (who was a lifelong amateur printer) so it’s a shop with many sentimental associations. NUMBER OF PRINTERS IN SPACE: While we enjoy in-house projects such as little books and ephemera, we have a steadily increasing amount of job work, mostly done in connection with a growing group of graphic designers in Austin who ship us their letterpress jobs. While my son, currently away at law school, has shown interest in learning the trade, right now we have one printer and that’s me. 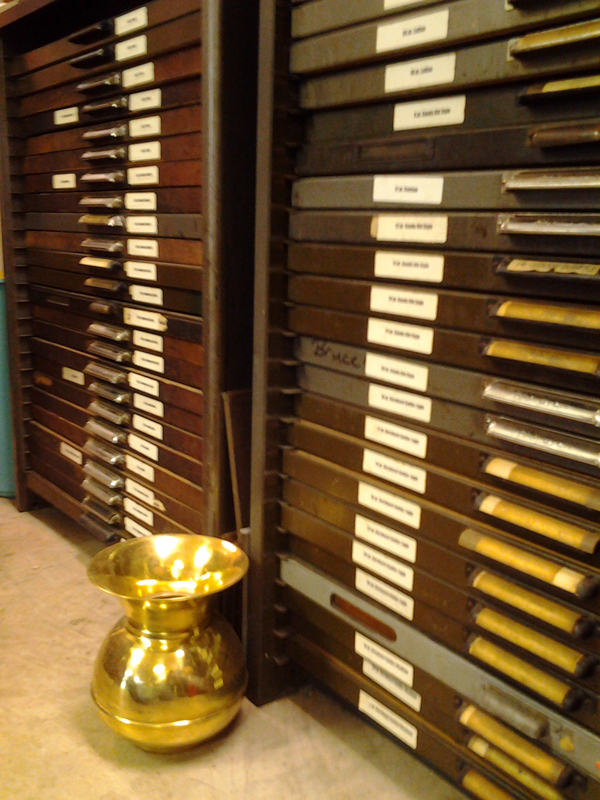 MOST VALUABLE SHOP TOOL: We treasure and enjoy all our shop tools and machines, but I think our most valuable asset is what I’d call the zen of letterpress, by which I mean assuming an attitude that’s calm, creative and useful to the work. 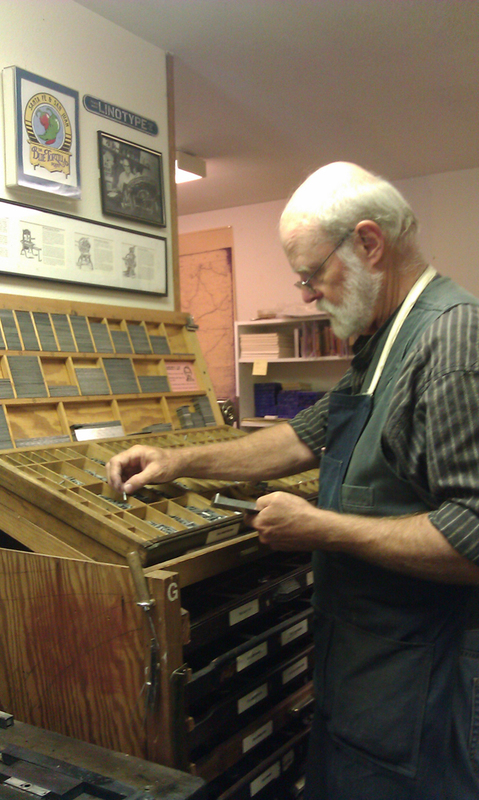 That would include an understanding that a letterpress project is almost always a series of problem-solving exercises, planning carefully, and having a big helping of patience. FAVORITE INK: We have used Van Son’s excellent rubber-based inks for as long as I can remember, though the testimony of some of your other bloggers has me very interested in trying out soy-based ink. As to color, it seems like when we’re printing something we’re designing ourselves, we sure do rely a lot on Scarlet red and Wedgewood blue; they make a nice combination on a page. SOLVENT OF CHOICE: When I first learned to print at the age of 12, my father told me, “Now here’s the drudgery part: cleaning the press.” I guess if I did have a technique that seems to lighten the drudgery, it’s wiping ink table and rollers with a dry rag as you go, right after loosening the ink with solvent. And as to that, we generally use off-the-shelf roller washes (currently using Varn’s V-120) for applications requiring a water-miscible solvent (rollers, poly plates), and a stronger type wash (Rogersolite) for things like metal type and the mixing glass. And while we’d never want to return to the days of 90 years ago when my dad and uncle used gasoline for cleaning everything, kerosene is still the sovereign remedy for dirty, oily machinery. PLATE AND BASE OF CHOICE: For almost all of our job work these days, we are using the Boxcar Press KF 152 (deep-relief) adhesive-backed poly plates on a Boxcar base. We became enthusiastic converts to photopolymer about a year ago and have been faithful enough that our old photoengraving vendor has inquired as to what happened to us. OIL OF CHOICE: To lubricate the press and paper cutter, we have had best results with “way oil,” the lubricant used in machine shops for drills, lathes, etc. FLOORING MATERIAL: Good sturdy concrete. When we built the building, the concrete contractor asked why we had drawn several 18-inch-deep piers underneath the slab. “You putting something heavy in here?” he asked. “Trust me,” I replied. FLOOR PLAN TIPS: I always thought the best-designed newspaper office I ever saw was the old Globe-News building in Amarillo where my dad worked, because it was designed by the paper’s general manager instead of an architect, and was arranged according to the work flow of putting out the daily paper. We tried to use that principle in laying out our shop, and placing the various elements where the work could easily flow from one point to the next. PIED TYPE: Oh, yes, a little bit, which I suspect is not uncommon in a handset shop, but we try to avoid it by making a habit of distributing type forms right after we’re through printing from them. Nonetheless, I think we may have a few galleys still holding a little bit of type set back in the late ‘60s. ORGANIZATION ADVICE: Other than the principle mentioned above of placing different work locations in a logical order, one of the most useful things is getting into the habit of putting tools back where they belong just as soon as one is through using them. PRINTING ADVICE: Once again, when things get challenging, take a deep breath and have patience. Plan each job carefully, “measure twice and cut once,” and keep faith that your materials, tools and machinery will do what you’re trying to achieve, even if they are making you figure it out step by step. (Not that there aren’t things that letterpress is simply unsuited for. In those cases, says one of my trusted letterpress mentors, a wise printer learns the value of the word “no.”) As another of your bloggers sagely observed, take care of your tools and machinery, and they will take care of you. This entry was posted in Work Spaces and tagged Boxcar base/plates in action, Chandler & Price Old Style, letterpress print shop, Sargent Brothers Printers & Typographers by Rebecca Miller. Bookmark the permalink.